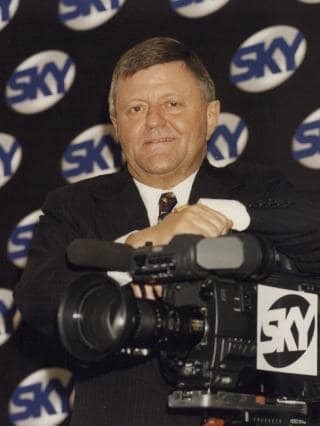 Sam Chisholm, sales director and former head of Channel Nine, Managing Director of BSkyB, and television executive extraordinaire, was also known as a legend in his own lunchtime. But lunches were special to journalists and tv executives in those days. My best mate, Cliff Neville, who died in 2012, was the supervising producer of Nine’s 60 Minutes and he loved working lunches. It’s where he was at his best, bringing people together, healing wounds that would have festered if they weren’t brought out into the open. Sam and my former boss, Ian Frykberg, then executive producer of the Nine Sunday Program and the editor of The Bulletin magazine, excelled in lunches like that. Okay, they drank, but they did deals and solved problems with journalists, media moguls, business directors and politicians, including prime ministers. And both liked loyalty. To keep loyal employees from leaving Nine, they would take them out to lunch. They stayed. Even if it was a long lunch that turned into dinner, the next day Sam and Frykers would remember every word from the night before. My memories of Sam came during his funeral service last week at a packed St Swithun’s Church in Pymble on Sydney’s north shore where every time you turned around there was another media executive: former Nine boss, David Leckie, Seven’s Bruce McWilliam (who wrote an excellent two-part tribute to Sam in The Australian), former News Corp chairman, John Hartigan, Fairfax Media Chairman Nick Falloon (who engineered the deal delivering Fairfax into the clutches of Nine this week), Foxtel’s Executive Director of Television, Brian Walsh, Fox Sports Head of Television, Steve Crawley, and Ten consultant and former Nine and Ten news and current affairs director, Peter Meakin, to name just a few. Others included Brian Henderson, Jim Waley, Paul Fenn, Vickie Jones, Caroline Frykberg, Helen Biven and Kamahl, a varied group of friends and colleagues. Sam’s friend and long-time maestro at Nine, Geoff Harvey, played the organ and piano, giving the congregation a lovely musical reflection after tributes by Sam’s daughter, Caroline Jumpertz, and his former business partner at BSkyB David Chance. The four score and three-year-old Harvey still knows how to tickle the ivories. Sam’s wife Sue and Caroline were inseparable at the service (Photo above Caroline and Sue. Picture: John Feder The Australian). Caroline talked about her happy upbringing, with Geoff Harvey playing Christmas carols on the piano and Humphrey B. Bear coming to her birthday parties, and Dennis Lillee occasionally bowling in the backyard cricket matches. She has tried to live up to her father’s advice: “Never big note yourself” but don’t be a wallflower either. She said her father had the uncanny ability to read people, as any Nine or BSkyB employee would know, and she told the media they could use any adjective to describe him since “most of them would be accurate.” I can think of a few, but Caroline nailed it when she called her dad a “tenacious, complex, charismatic man” and “generous” long before he became rich. I was a beneficiary of Sam’s generosity in 1987 when I was called to his office after Ian Frykberg had told him that I was going to have a double hip replacement in a month. “Tom,” he said, “I think you need to lose some weight before the operation. If you lose a stone this month, I will give you a flight to the US to see your mother.” With an offer like that, how could I say no? In fact, the flight also included my wife and two young daughters. When I came back I gave him the “key” to San Francisco, admitting I had purchased it in a pawn shop, probably pawned by a poverty-stricken politician, because what else could you give a man who had everything. Sam said: “Well, Tom, I’m glad you enjoyed the trip because you’ll never get another one like this.” He was right. Everybody has a Sam story. Geoff Harvey got a trip around the world from Sam after he gave up smoking for six months. Tim Sheridan, a veteran sports journalist at Nine, and now senior sports correspondent at Fox Sports, told me at the wake about the time someone had borrowed his car at the station and parked Sam’s car in. Tim saw Sam at the door looking very angry and went up to apologise. Instead of bagging Tim, he said: “Is that your car? Isn’t it about time you got one you deserve?” A few days later, Tim got a new car. David also talked about his generosity: Summer holidays with Sam and Sue in the south of France and how other friends would get to party with Miss October, on the back of a Harley Davidson. Sue Chisholm’s tribute was shorter; how she managed to do it, given her last few weeks, only demonstrated her bravery. “My darling Sam,” she began, remembering his warm smile, and how Sam “never complained – ever.” She also told the gathering that Sam had left her with the irreplaceable feeling of being “deeply understood and completely loved … Sam was my rock. He was my anchor … My darling Sam.” There was hardly a dry eye in the church at the end. Despite his illness, Sam didn’t go into hospital until Friday and he died on Monday night with his family around him. Sam Chisholm even knew how to die well. At the wake afterwards in their lovely home on the north shore, there were more stories about Sam, his generosity, never being afraid to speak his mind, and his love of motorcycle riding. His daughter Caroline said Sam was definitely not a Trump supporter. She was in New York on election night, and Sam called hoping that he had lost. Unfortunately, he didn’t. I was happy to hear Sam never liked Donald Trump. And my favourite anecdote at the wake came from Caroline. Before the renovations that transformed a weatherboard ranch-style house into an extended home at each end, building upwards with huge windows, Sam used to ride his motorbike from one end of the smaller abode to the other end in the bedroom. When Caroline and Sam’s first wife, Ronda, came home, they could smell a whiff of petrol in the air. “My father was crazy,” joked Caroline. Sam might have been a bit crazy in those days (we all were), but he loved his family, he loved his job and he was one of a kind. We will not see his like again. ← Dear Diary: Why hast thou forsaken me?